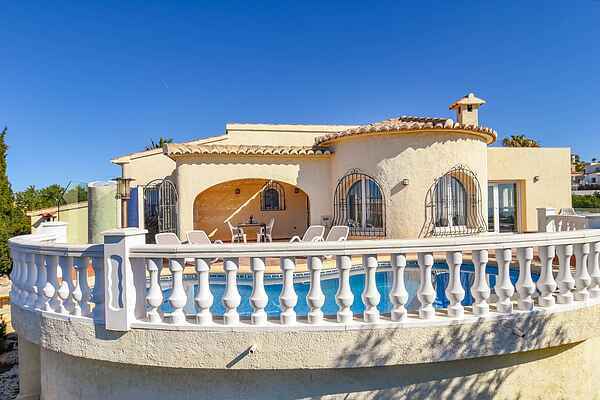 What a fabulous villa in the lovely quiet Cumbre del Sol district, just 5 km from the charming town of Moraira! You'll be staying in this beautiful single storey villa with a clean and tasteful interior design. The distinctive arched doorways and tiles are typically Spanish. From the sitting room you pass through sliding doors to the covered terrace. The bedrooms are spacious and comfortable. The perfect home base for a relaxing holiday. From the terrace you have a unique view of the green surroundings while you laze in the sun. The reniform swimming pool with outdoor shower provides for a refreshing swim. The lower level stone patio is a great place to enjoy a fish or country bacon fresh from the BBQ! Add a glass of wine and your holiday is complete! Restaurant and supermarket 2 km away. In Cumbre del Sol (2 km) you'll find the beach along a beautiful bay. In Moraira (9 km) you can wander through the narrow shopping streets, have a drink overlooking the sea in one of the many restaurants and enjoy some tapas or fresh fish. From Teulada (10 km) you can take the train, for example to Altea (25 km) or even to Alicante (80 km). Shopping service upon request. Please note: The usage of WiFi is free, but limited to a maximum of 8GB per week. In case you use more than the limit, the connection speed will be lowered to a point where you can only use such services as WhatsApp and e-mail, amongst others.